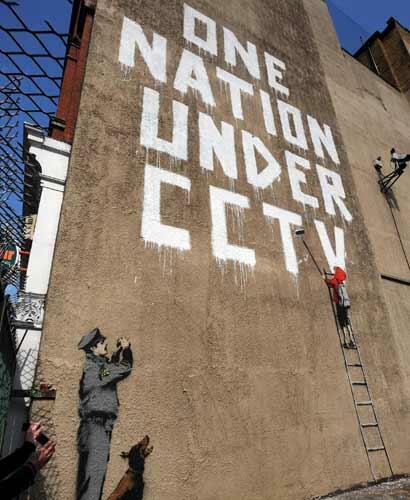 In May 2012, a new Banksy wall painting in Turnpike Lane was excitedly reported by the world’s media. 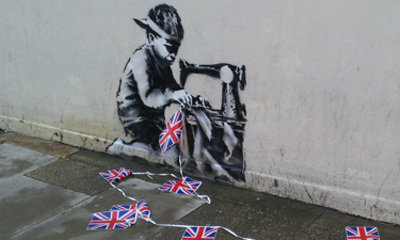 Depicting a child making Jubilee bunting, the trail of flags were removed after less than 24 hours. Now that the debate as to whether graffiti is art is long over, a new problem has arisen with street art: it’s easy to ruin it. 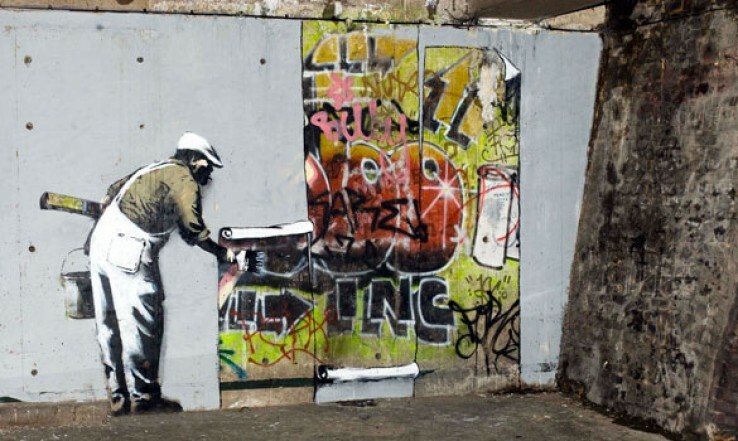 While many of Banksy’s pieces have been covered with plexiglass by the owners of the buildings they appear on, countless works have been destroyed. 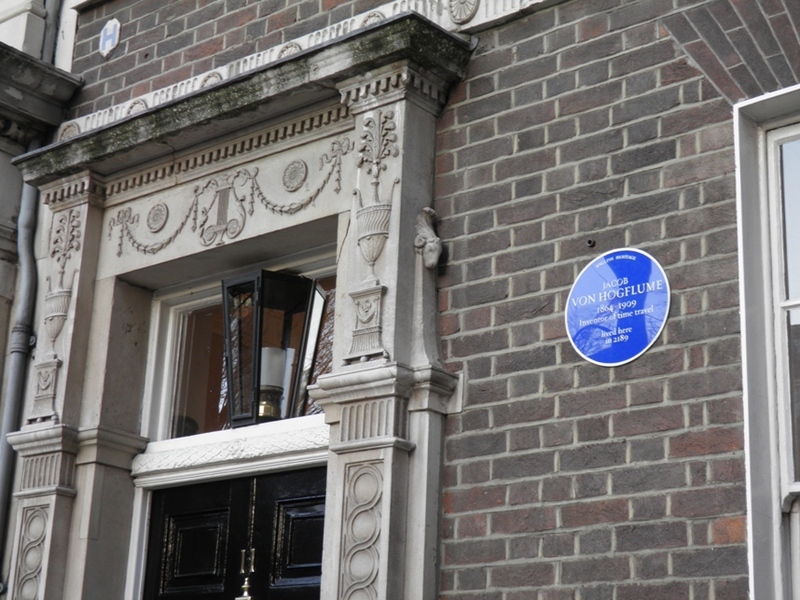 There’s all manners of ways in which London is deprived of these pieces of public art. Less professional attempts have also been made to remove pieces for sale: Lily Evans wrote an article for Vice Magazine about her disastrous attempt to retrieve a famous rat which ended in the complete destruction of the piece. Similarly, some pieces have been removed not for profit, but by local councils, keen not to have their workplaces despoiled. 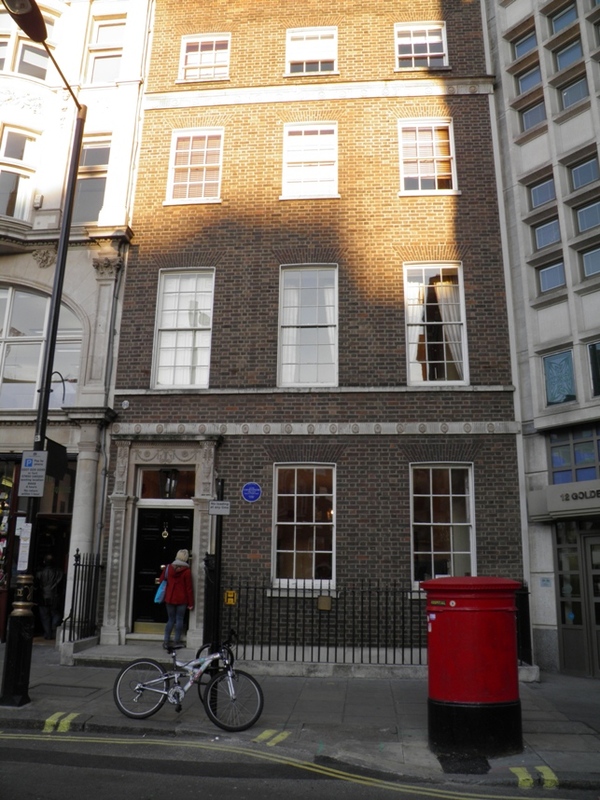 In October 2008, Westminister City Council demanded the removal of a huge mural painted on a building part-occupied by the Royal Mail sorting office on Newman Street. 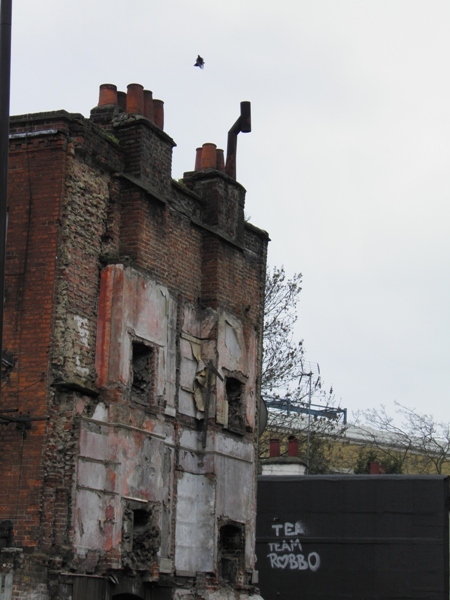 While the Council said the owner of the building was free to do what he liked with the three-storey high-image – sell it or exhibit it elsewhere – they demanded it be removed from the site. 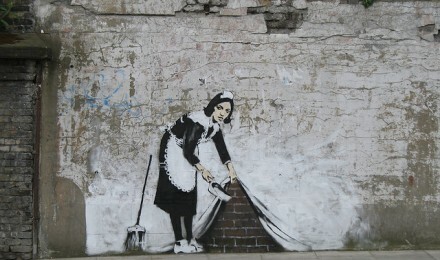 Westminster Council couldn’t have taken a more opposing view to Camden, who had long spoken of their admiration for Banksy’s maid, which had been stencilled on a wall belonging to the Roundhouse close to Chalk Farm Road. The maid was obliterated with white paint. 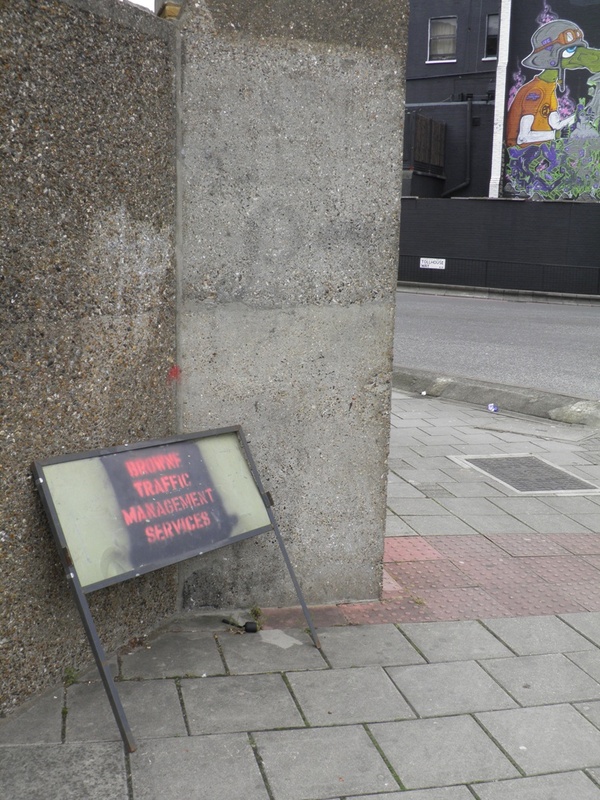 The whitewash attack in Regent’s Park Road was made under cover of darkness, with a sarcastic calling card wishing “All the Best – Vida” left spray-painted at the scene. 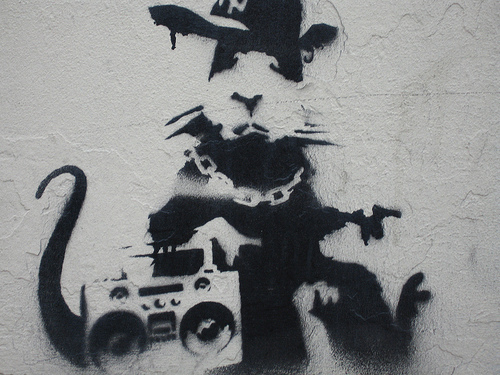 The actions of the mysterious “Vida” fly in the face of an unspoken law practised by council officials, which has seen Banksy’s street art preserved, even retouched, while all other artistic offerings on the same wall – the most recent a life-sized wooden mantelpiece – are swiftly removed. Beyind saving, the council commissioned a large mural from the Brazilian artist Eduardo Kobra to replace it. 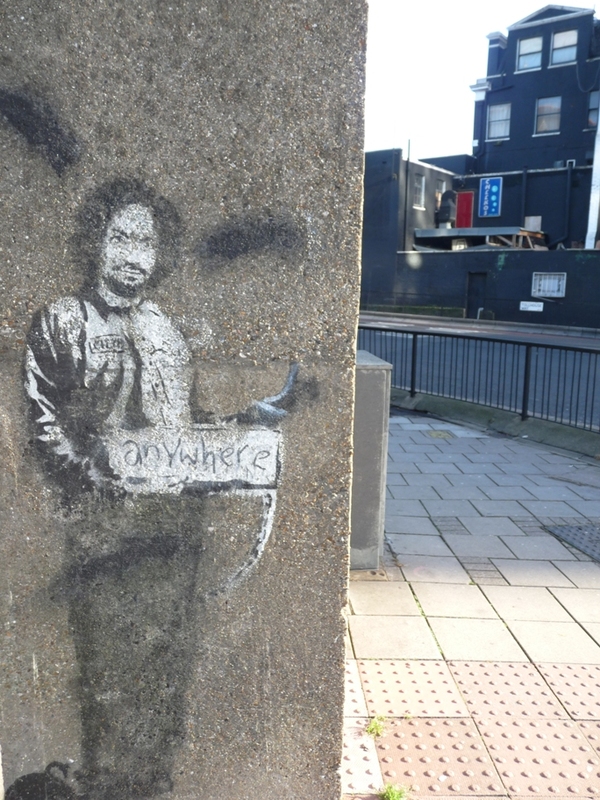 The needless defacing of Banksy’s works has never been more apparent than in Archway, where one of his most famous stencils of Charles Manson hitching a ride to ‘Anywhere’ had stood opposite the McDonalds on Junction Road since 2005. One of the oldest of Banksy’s large-scale works, by the time I took these photos in 2009, the image was weather-worn and some additional graffiti had appeared. 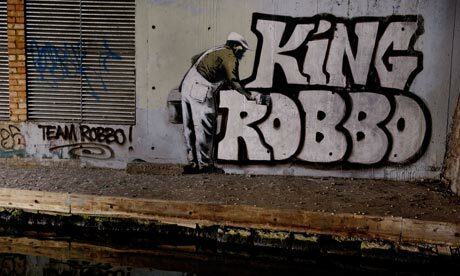 But in 2010, Banksy was accused of altering a twenty-five-year-old tag by Robbo (described by the Guardian as “one of the founding fathers of the London graffiti scene) on the Regents Canal. 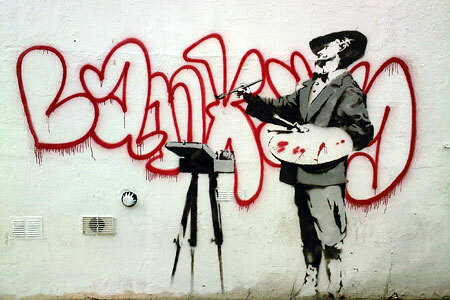 By now hugely successful, Banksy eliminated much of the original with the addition of a workman pasting the tag up like wallpaper. 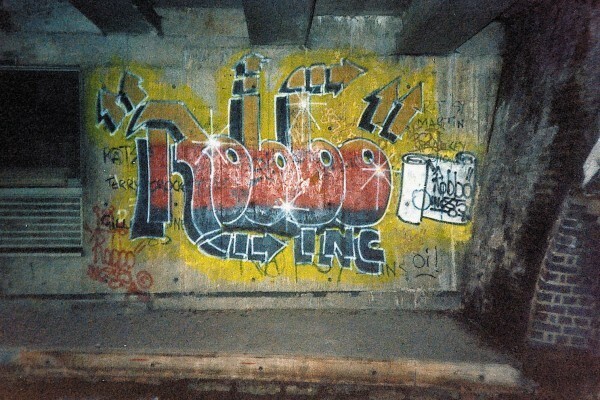 Insulted by Banksy’s actions, Robbo (now dubbed King Robbo) returned to re-alter the altered tag. In an interview with the Sabotage Times, Robbo said he did it himself, scooting across the canal in a wetsuit on an inflatable lilo. He broke a graff code of conduct and for a lawless community we have a lot of laws, so I had to come back. What people don’t realise is that he’d already gone over loads of my stuff before and I hadn’t bothered retaliating but this time it was just so deliberate, so cowardly. If you’ve got the hump about something, you send a message and discuss it like gentlemen, you don’t wipe out a piece of graffiti history. 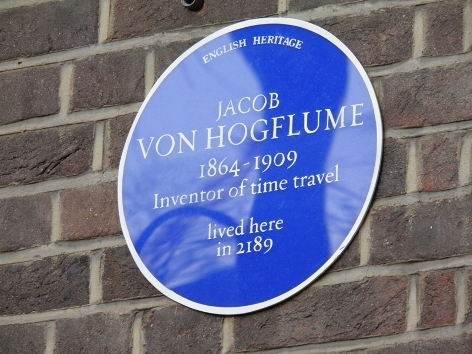 The alteration to the sign was quickly buffed out (presumably by the Council) and the original figure was left holding a blank sign for a couple of months. 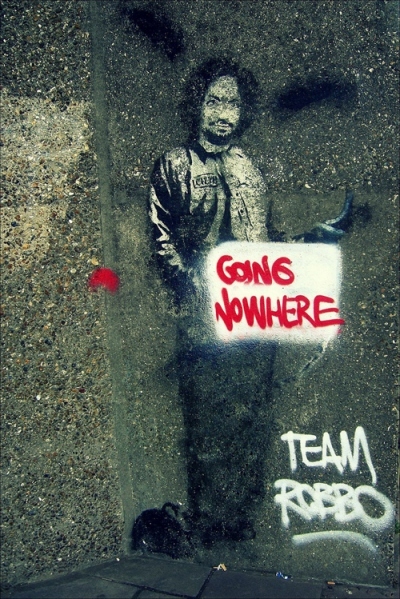 But in November 2011, supposedly irritated by the respect accorded to Banksy by the authorities while their own efforts had been cleaned away, someone from Team Robbo decided to entirely obliterate the Hitchhiker with white paint. 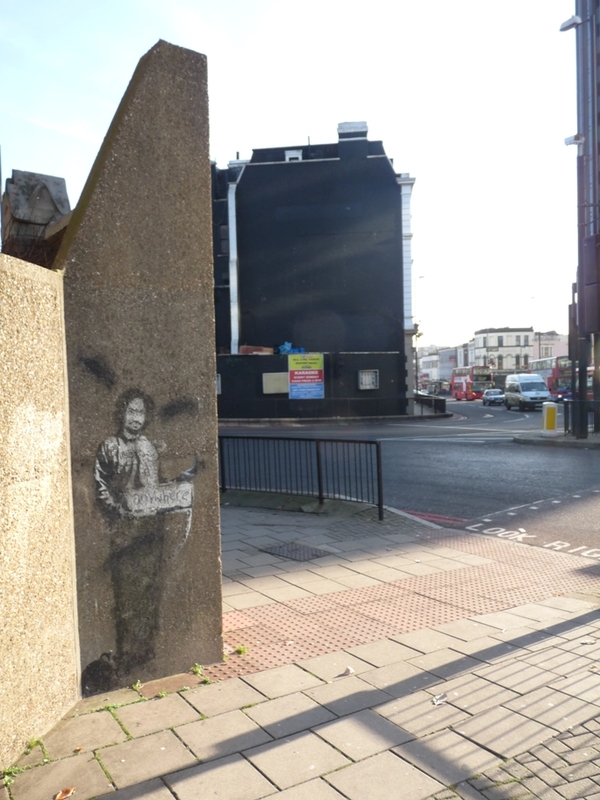 Regarding the Archway piece, Team Robbo and Team Banksy are still ‘at war’ and, unfortunately, there is sometimes collateral damage to innocent artworks. It has become increasingly hard for us to verify whether or not a specific artwork has been attacked or damaged in crossfire. 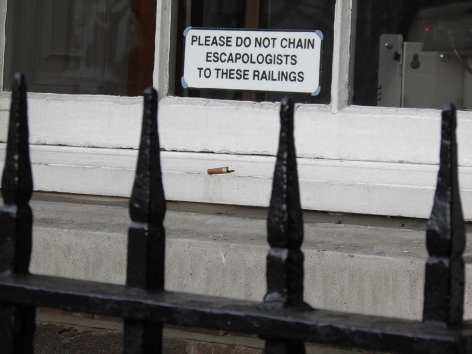 Furthermore, many writers outside the Team Robbo crew in London are involved in covert actions. After six months, the decision was taken to clean the work off the wall entirely. 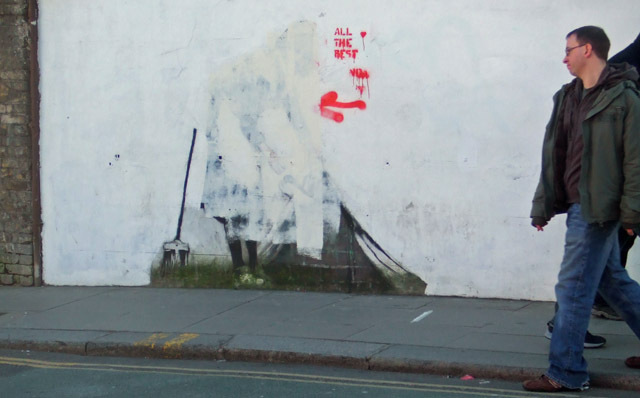 All that remains after five years is a pale, ghostly outline of the Banksy. 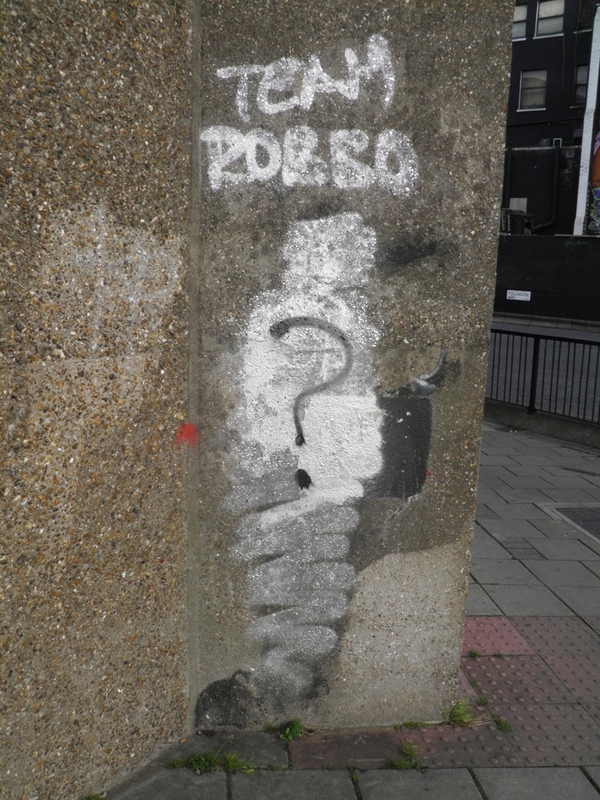 Team Robbo have occassionally tagged the Archway area – here’s their hesitant contribution from a nearby building site next to the Whittington and Cat pub which appeared in the last couple of months.